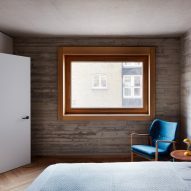 Allford Hall Monaghan Morris has created a mixed-use building in the London borough of Southwark, featuring wood-lined windows set into brick facades. The building at 81-87 Weston Street, occupies a gap site close to Renzo Piano's Shard, which previously housed a single-storey warehouse building used by leather traders. AHMM designed the building for developer Solidspace, which previously had its offices in the old warehouse. 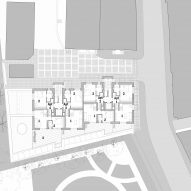 A brick outer wall that separated the warehouse from the park was retained and incorporated into the new scheme. 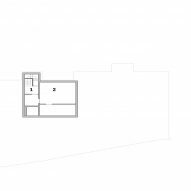 The London-based architecture studio was tasked with accommodating eight multi-level apartments above a large office space on the ground floor. 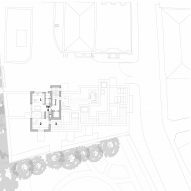 The office's entrance is located on Weston Street, while the residential units are entered from a lane to the north. 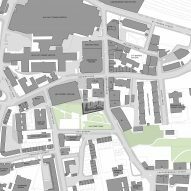 The urban fabric in this area of London comprises mid-rise Victorian warehouses interspersed with more modern developments. 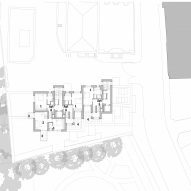 The design of the new building is intended to echo the heterogenous nature of its surroundings through its form and materiality. 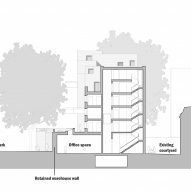 The structure steps up and away from its neighbours on the adjacent Weston Street to retain their rights to light, while the jumbled composition of the brick volumes reflects the staggered arrangement of the internal spaces. 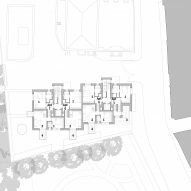 Some of the apartments feature terraces incorporated into the stepped roofline, while large pre-cast balconies that cantilever from the south facade provide others with an outdoor space. 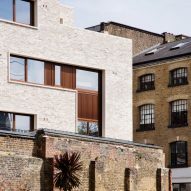 The pale-brick facades are interrupted by L or T-shaped windows set into deep reveals that articulate the facades and provide glimpses of the split-level interiors. The use of brick and anodised-aluminium windows is intended to evoke the industrial aesthetic of the surrounding warehouses. 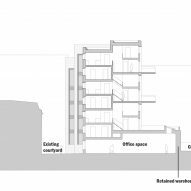 "Weston Street is a sectional tale of a spatial idea finding a site, a form and a facade," said AHMM director, Simon Allford. "Cast in concrete and faced in clay it is brutally simple." 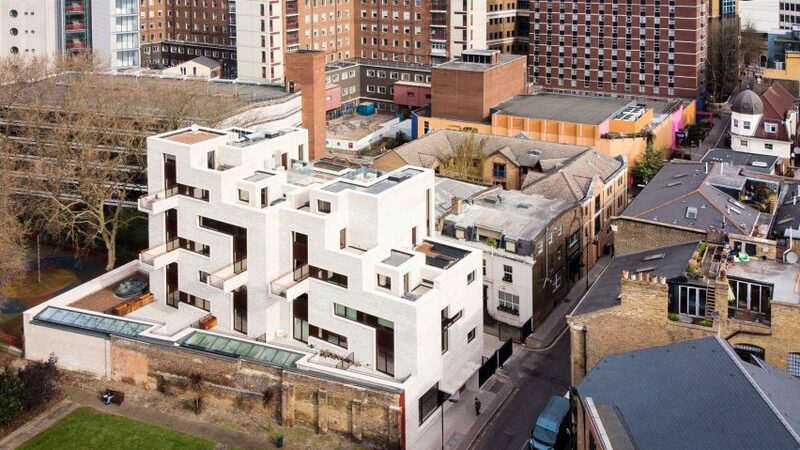 "Eight apartments interlock around two stairs and an office below to create a 21st-century mansion block," the architect continued. 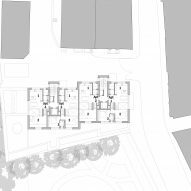 "One where each apartment is a 'house' differentiated by its place within the spatial puzzle and the city." 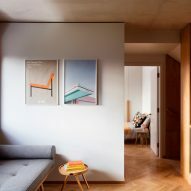 Internally, the apartments adopt a strategy that Solidspace has applied across several previous projects, with rooms distributed across a sequence of split levels. 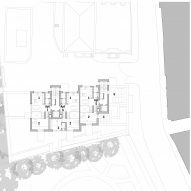 At the centre of each apartment is an open-plan double-height space containing the internal circulation and the main social spaces. 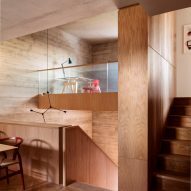 Stairs rather than doors are used to separate the living, kitchen, dining and study areas, with more insular bedrooms positioned above, below or alongside the living spaces. 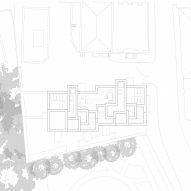 The apartments slot together around the communal stairs to allow for two and three-bedroom configurations. Entrances open into the living spaces, which are positioned on the south side of the building and are lined with large windows connected to either a balcony or terrace. The building features a structural concrete shell that was required to enable the inclusion of the large, irregularly shaped windows. 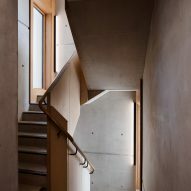 The concrete was cast in situ and the resulting board-marked surfaces are left exposed throughout the interiors, where they combine with extensive joinery to create a textured and handcrafted feel. AHMM is headed up by Simon Alford, Jonathan Hall, Paul Monaghan and Peter Morris. It works across projects of varying scales, and previously transformed a 1930s block overlooking the River Thames into a new headquarters for London's Metropolitan Police Service.